A links is the oldest style of golf course, first developed in Scotland. The word "links “comes via the Scots language from the Old English word hlinc: "rising ground, ridge “and refers to an area of coastal sand dunes and sometimes to open parkland. It also retains this more general meaning in the Scottish English dialect. It can be treated as singular even though it has an "s “at the end and occurs in place names that precede the development of golf, for example Lundin Links, Fife. The land was unsuitable for building houses due to its sandy nature and equally unsuitable for farmland due to the salt content of the turf. Links courses tend to be on, or at least very near to, a coast, and the term is typically associated with coastal courses, often amid dunes, with few water hazards and few if any trees. This reflects both the nature of the scenery where the sport happened to originate, and the fact that only limited resources were available to golf course architects at the time, and any earth moving had to be done by hand, so it was kept to a minimum. Even today, some links courses do not employ a greens staff, use only basic machinery such as hole cutters without boards to ensure that the hole is cut evenly, and use grazing animals to keep the grass chopped. Links courses remain most common in Ireland and also in Great Britain, especially in Scotland. The Open Championship is always played on links courses, and this is one of the main features which differentiated it from the three major championships held in the United States. The style of play on a links golf course is considerably different form the style of pay on other type of courses. The challenges of links golf fall into two categories: Firstly the nature of the courses themselves, which tend to be characterised by uneven fairways, thick rough and small deep bunkers known as "pot bunkers “and secondly, due to their coastal location and lack of trees, may links courses are frequently windy. This affects the style of play required, favouring players who are able to play low accurate shots. As many links courses consist literally of an outward nine in one direction along the coast, and an inward nine which returns in the opposite direction, players often have to cope with opposite wind patterns in each half of their round. We are proud to offer you only the best and that is why we are favoured by many overseas Guest as well as local visitors and corporate Clients including Embassies. We are an upmarket establishment emphasizing the needs of our clients to make the experience an unforgettable one. · Location location location. 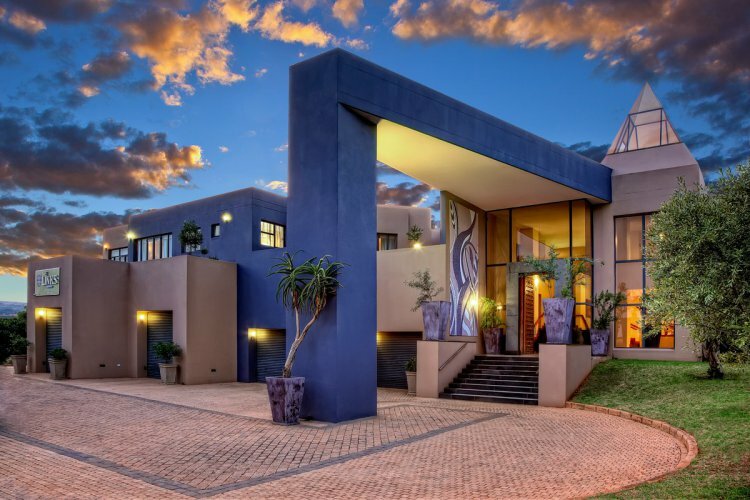 We are situated in the heart of the Silver Lakes Golf Estate with excellent security offering splendid views over the surrounding golf estate, lakes and lovely garden. · Special attention was given to the interior decorating and design and portrays as unknown elegance with a vast variety of Persian Carpets & Leather Couches to create a style one of a kind to ensure that your stay is a pleasant one. Delightful golf pictures were purposefully chosen, adoring its walls throughout the house complimenting the name. “The Links”. · Our Highly Qualified Team is professional, well trained to personal service and dedicated to welcome all our clients to make them feel at home and their stay memorable and unforgettable. · Ample safe & secure parking. Enough garages where each and every Guest can feel that is vehicle is safe. · Transfers are available to and from the International Airport.